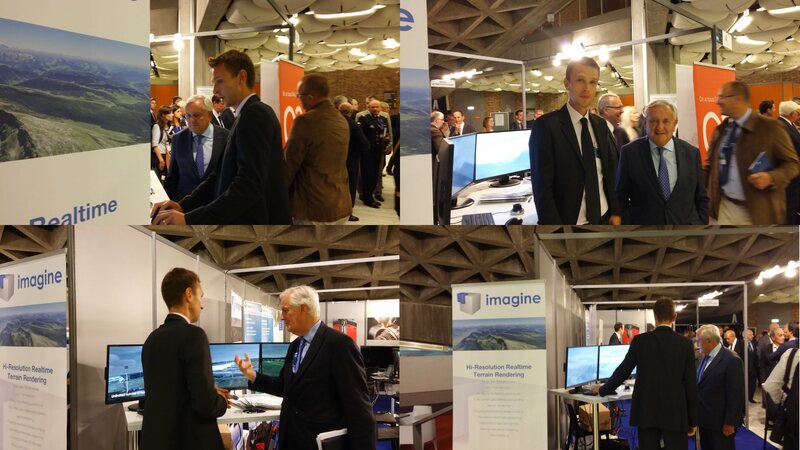 It seems ATC Global 2015 was great. Although we haven't been physically attending the show, our IG software has been demonstrated on not less than 3 booth, all run by some of our happy users. We are really pleased about that, and hope they all were successful ! Thanks to Alsace Innovation, we had the opportunity to demonstrate our products at the 13th Université d'été de la Défense. The event took place in Strasbourg (14th and 15th September). French Army general staff, current and past ministers, in addition to some of the biggest defense industry companies CEOs were present. Mr Jean-Pierre Raffarin (former French prime minister), Mr Michel Barnier (former minister) and Mr Jean-Yves Le Drian (defense minister) offered some of their precious time to visit our booth. As you might know, we have introduced water rendering in our IG software, including oceans, lakes and rivers. We have made a short video showing how good it looks. Enjoy ! Looking back, 2014 has been a very busy year – as usual one would say ! As you know, Francis joined the company in January; his experience in video-game and 3D engine development, as well as his critical thinking, have both helped in getting our technology faster and more stable, and our architecture better and cleaner. New projects have been completed during that period: Bulgaria, Brazil, Fujairah, Bolivia, Saudi, etc. The IG software user base has grown significantly, what makes us even more motivated. Some users have now upgraded to IG v3 and can now enjoy the many benefits offered by the new software generation. We have significantly improved our software over the last twelve month, with massive technology development, performance optimization, graphical enhancement and new features : scene generation now being a matter of minutes, volumetric snow rendering with dynamic clearance, street lights and 3D models instancing, lighting improvement, full vegetation rendering system rewrite, aircraft tracks of history, aircraft information labels, terrain resolution improvement, high quality terrain vector data, etc. This development effort will continue in 2015. Upcoming 3.4 release will bring some major improvements as well. The Airport Editor will turn into a much more general Scene Editor tool, with more features, additional editing capabilities, which should lead to nicer scenes and better productivity. Master/slave time synchronization system has been fully rewritten from scratch, you will be really surprised on how smooth your simulator will be ! Now, we would like to thank all our IG users for that great year, without your trust and support this wouldn’t have been possible. We wish you all a merry Christmas, and all the best for 2015 ! ITEC 2014 is over !